ter kar (pig trotters) nice gummy tecture & tasty. people took most of it i managed to get some odds & ends. 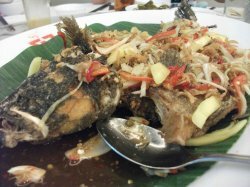 the i think ikan selar? was good. people took the tails so only eft heads. 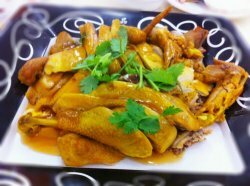 I would like to recommend the yam ring from Gim Tim. It is huge, only about $15. 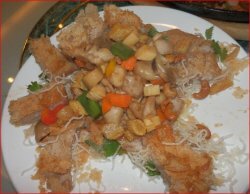 There are a lot of ingredients within – cashews, chicken, corns, capsicum, carrots, mushroom etc. All are in very generous servings. 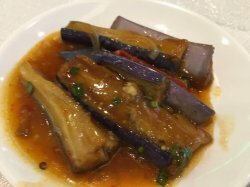 I like it a lot because the yam is soft and tasty, while crispy on the outside. The yam ring doesn't have an oily after taste or those bad oil taste. The chickens are fresh and juicy. 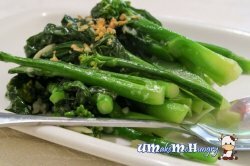 The cashew nuts and greens added texture and taste to the overall dish so that it's not so boring just eating the yam. Staff service is fast and friendly. Prefer to go on weekdays when there’s not so much crowd. We are frequent diners of Gim Tim. 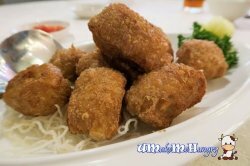 Love the food there, not too salty or oily. And the price is quite reasonable - they don't charge service charge. Only GST. 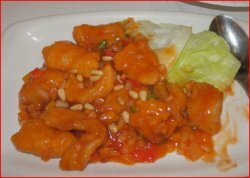 Like the sweet sour fish with pine nuts the best. very yummy. 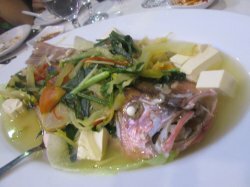 We always order this dish when we dine in Gim Tim. 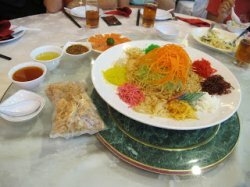 Other dishes to recommend include yam paste, the yam ring. 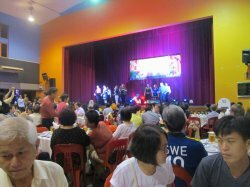 Tonight the family is attending a Dumpling Festival and Parents' Day Dinner event at Sembawang Community Centre. 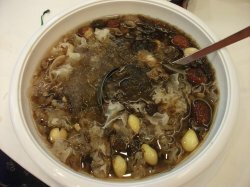 The dinner is a 7 course Chinese style sit down dinner which is catered from Gim Tim. We start the meal with pipping hot rice dumplings. 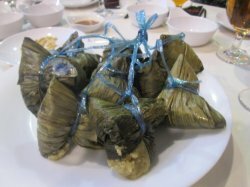 The rice dumplings are not well wrapped as some have the rice popping out. 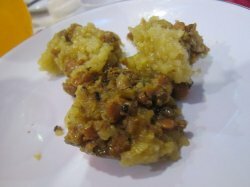 The rice tastes too mushy and soft, too difficult too scrap off the leaves. 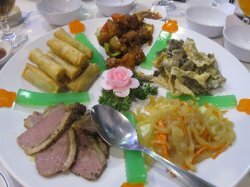 Next we have the 5 combination platter - jellyfish, deep fried spring rolls, smoked duck, spicy chicken and deep fried fish skin. 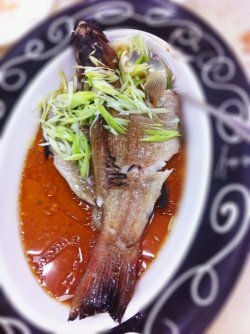 I like the fish skin which is very thin and crispy. 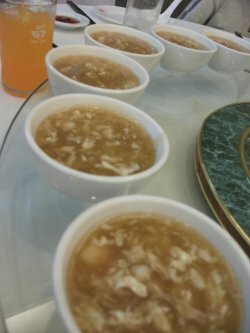 This is follows by the shark's fin soup. 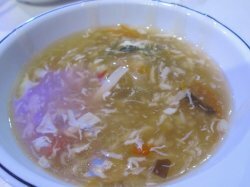 It looks like a thicken soup with mushroom, and carrot strips. Next is the roasted chicken. 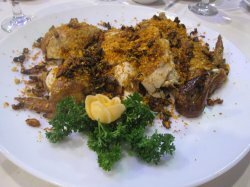 It is quite unique having crispy dried chilli pieces on top of the chicken, which gives the dish a spicy taste. 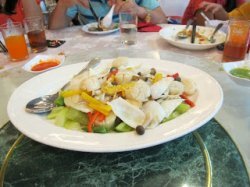 Next is the steamed fish in teochew style with pickled vegetables and beancurd. 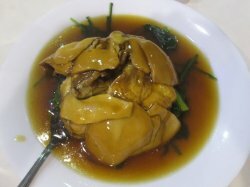 This is follows by the braised spinach, beancurd skin and abalone. 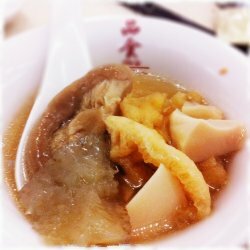 The beancurd skin has a too sweet taste and abalone seems to be the mock meat type. 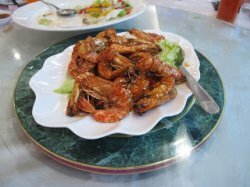 Next we have the drunken herbal prawns, which I could barely taste any hint of herb in the juicy prawns. 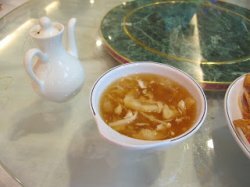 It is followd by the well braised fried Ee Fu Mee with yellow chives. Simple and tasty. 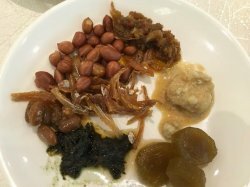 The meal is ended with yam paste with sweet corn and ginkgo nuts. 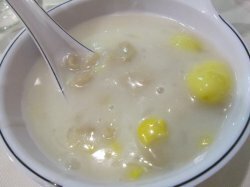 I am surprised to see a bowl of white when served. 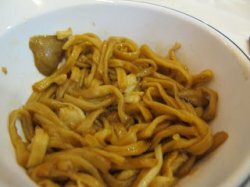 It seems that the sauce that served on top of the yam paste is too watery and tastes gluey to me. Best get rid of the white sauce. Overall the meal is still alright. Drink is refilled regularly. 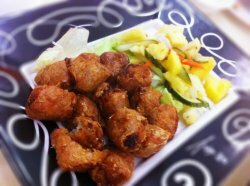 Overall, I really like the taste, presentation and creativity of the food in Gim Tim. 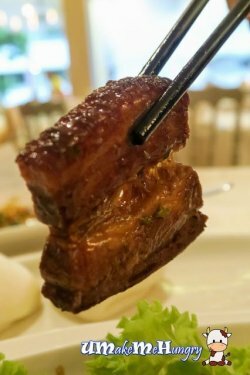 It seems the combination of Hokkien and Cantonese cuisine created many well-balanced dishes that are perfectly executed. 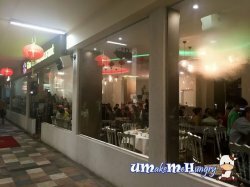 I really enjoy the food here and I can't wait for the next visit to use the lucky draw voucher that I won. Cheers and Huat Ah!!!!! Good Catch for a set dinner! Small Uncle and Aunt buying us dinner and they have also booked the tables at Gim Tim total 4 tables for the Goh & Tan family! Is great to have gathering cos everyone was busy and is a good time to have dinner together and catching up. 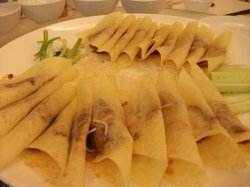 - Crispy Peking Duck - Not very crispy but it was good I still prefer to wrap it on my own. 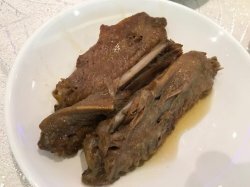 And the Peking Duck meat was stir-fried and serve with lettuce and we can wrapped and eat with it and is really good but it was really filling! - Mini Abalone stuffed in Japanese Pocket Tofu - more like Inari sushi but this is not stuff with Japanese rice but with mini abalone. 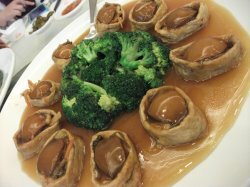 Taste nice with that combination and the gravy goes well with the boiled broccoli! 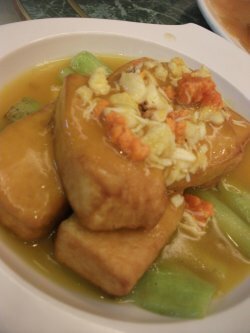 - This tofu is an additional for the kids as the fish was consider spicy for the kids... steal a bite from my girl, the tofu was really silky and soft ..... melt in the mouth! 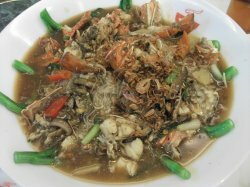 - Wok Fried Lobster with Rice Vemercelli - by this dish I am already quite full but this was really good the vemercelli absorb all the sweetness of the gravy so when you chew it the sweetness just burst into the mouth! Lobster was fresh too! 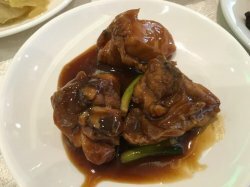 - Fried Chilli Crab with Singapore style - meat was thick and fresh and the gravy was good too thick and tad spicy goes well with a deep fried bun! 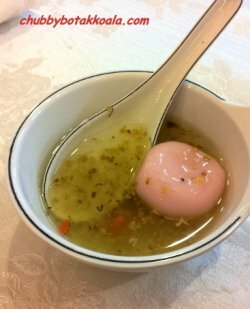 - Chilled Cheng Tng with Lotus Seed - this was extremely sweet .... I didn't finished this just one mouth and I gave up! 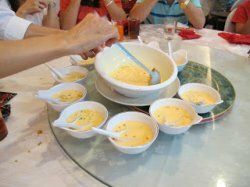 Overall dining experience was good, the elderly group enjoyed the session over the dinner so is our generation! And the dinner package was a good catch! 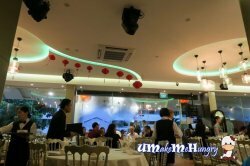 every year during CNY, my BIL will ask us out for dinner together with his parents.. this year we decide to go Gim Tim for dinner.. 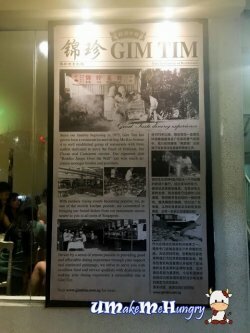 I have heard many reviews about Gim Tim but has yet to go try... the food is nice and service quite prompt.. place is clean but not very spacious.. 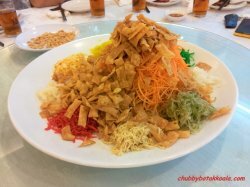 Without fail, most restaurants will have yusheng during CNY period, the Yusheng at Gim Tim is not bad too but I still prefer Dragon Phoenix Yusheng. 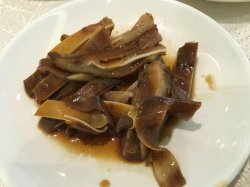 Sharkfin soup, not bad, the stock they use is very nice and not very salty. 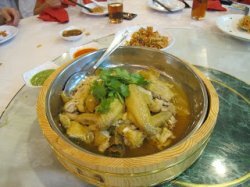 Chicken, I think they use kampong chicken and thus the chicken meat is very tender. 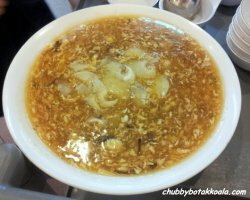 They cook this dish with minced ginger sauce, very yummy. 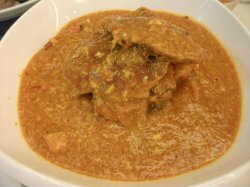 Cannot rem the name of this dish. 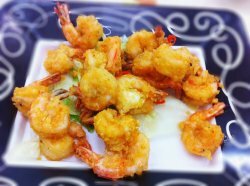 Prawn, they deep fried the prawns and then fry it again with a nice, sweet sauce. 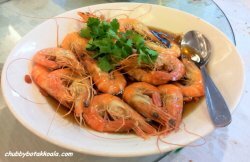 Thou the prawns are deep fried but you can still taste that the prawn is fresh and does not stick to the shell. 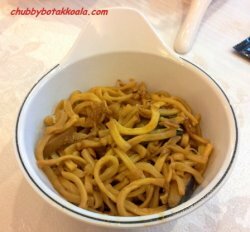 Ee Fu Noodle, nice, not too dry and not too salty. 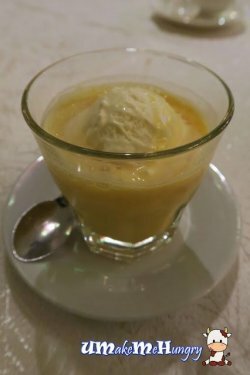 Desserts, mango pamelo. Nice, refreshing and not too sweet. this restaurant that i've grown up with is in an unassuming location in a quiet corner of amk ave 4. but. don't bother walking in without reservations.you probably won't ever get a seat. i really kid you not! 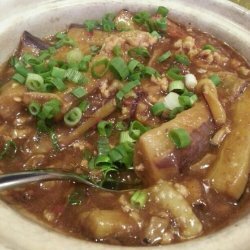 so make reservations ahead of time.and you'll definitely get to indulge in this claypot of mince pork and eggplant!this made me eat 1.5 bowls of rice. it is evil. purely delish evil. this restaurant that i've grown up with is in an unassuming location in a quiet corner of amk ave 4. but. don't bother walking in without reservations. you probably won't ever get a seat. i really kid you not! so make reservations ahead of time. 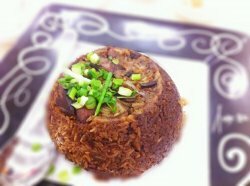 and you'll definitely get to indulge in this claypot of mince pork and eggplant! this made me eat 1.5 bowls of rice. it is evil. purely delish evil. Attending a Chinese new year dinner, catered by Gim Tim. A lot of items inside. Very flavourful. 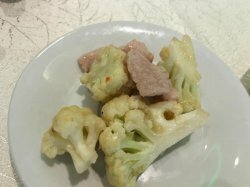 A rather weird and dry dish. Too much pepper which covers the taste of the fillings. The aunties almost don't want to serve this as all are rushing to pack up and go off. A lot of tables are not served. I keep on asking for it. 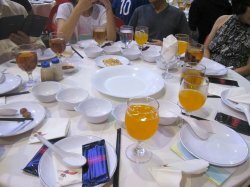 After serving, the aunty still got the cheek to ask if I want it, as the table next to me is also waiting for dessert. 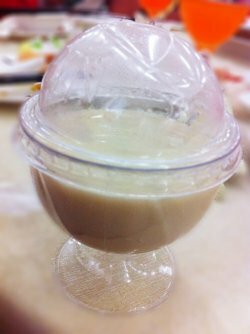 Tastes like a more watered down version of Lao Ban. 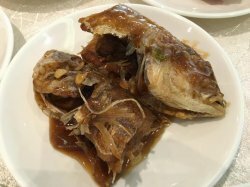 Braised Boneless Duck with Sea Cucumber - We ordered this dish thinking that it was sufficient for 3 people. 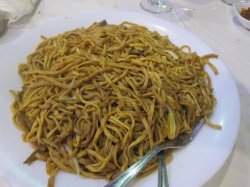 It turned out to be much bigger than expected ( I estimate it to be for about 5 pax) and we had to doggy bag the left overs. 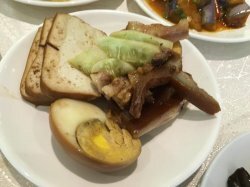 The duck meat was tender yet firm and fibrous while the sea cucumber was not too soft and chewy. Both came in generous servings. Just a little something that I learnt about the cooking procedure for this dish. 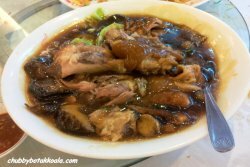 The duck has to be fried first till crispy and then simmered in the gravy to let it absorb all the flavours. 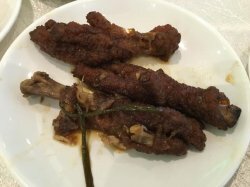 Thats why the duck meat still manages to remain firm when served. 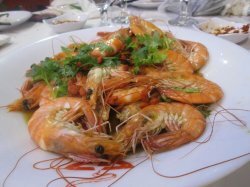 Broccoli with Prawns - A most excellent dish with the sizeable prawns fresh and crunchy and the broccoli cooked just right. Simple yet tasty. 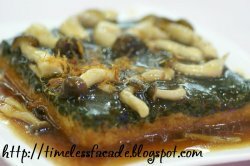 Home Made Beancurd with Spinach - A little crispy on the outside and soft on the inside, the homemade beancurd was decent, but still had room for improvements. One major flaw is its lack of taste, even with the spinach. 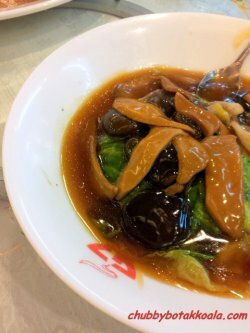 I did like the mushrooms that came with it though, wildly refreshing yet not overpowering. >$80 for 3 pax might seem a little too much given the variety of food and cost of items. However, no one complained. Honestly, I think the quality and potions more than justify the price. Throw in good service minus the service charge and this place goes into my book of must return places.